William Gimby was born Vladislaw Gimbutis in 1914 in Svedasai, Lithuania. His father, Adamos Gimbutis, was born in 1884 in Lithuania and came to America in 1906. The father settled in New York City, at 356 Graham Avenue in Brooklyn, where he worked as a tailor. After four years he had earned enough to send for his Lithuanian bride, Monika Papritz. She was born in 1890 in Lithuania. In 1910 at the age of twenty she came to America to marry Adamos Gimbutis in New York City on August 7, 1910. One year later, on August 1, 1911 their first child, Vitalt Gimbutis, was born in Brooklyn, which made him the first U.S. citizen in the family. In June of 1912 the Gimbutis family returned to Svedasai, Lithuania, for a summer vacation with relatives. Unfortunately, political unrest spread though the country at that same time, forcing the Gimbutis family to stay in Lithuania, where their second child, Vladislaw Gimbutis, was born in 1914. The parents raised both sons in Lithuania for the next six years. Lithuanians suffered tremendous hardships to endure both World War One and the Russian Revolution. On October 13, 1921 the family left their homeland and sailed on the steam ship Latvia from Libau to NYC, where they arrived three weeks later on November 9, 1921. The passenger manifest identified the Gimbutis family members as Adamos (age 40), Monika (age 31), Vitalt (age 9), and Vladislaw (age 6). 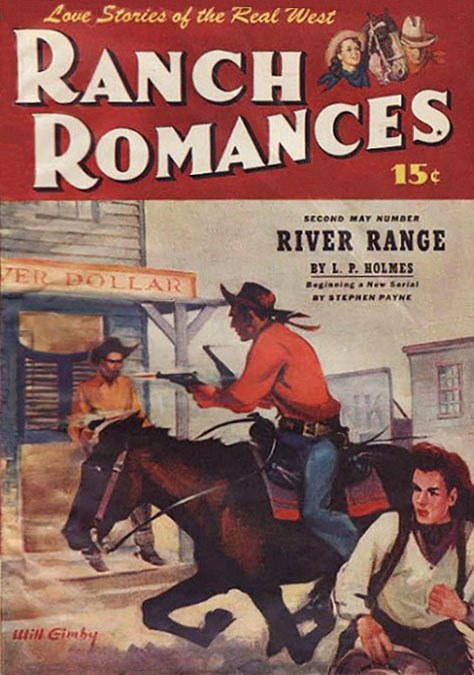 They settled in Brooklyn at 232 Ainslie Street. The father worked as a tailor while the mother kept house. The two sons attended public school, where Vitalt was enrolled as "Albert" and Vladislaw was enrolled as "William." In June of 1926 the older brother, Albert Gimbutis, completed the eighth grade, after which he began to attend a vocational high school. After three years of training he entered the work force to help support the family. He worked for a Brooklyn construction company. 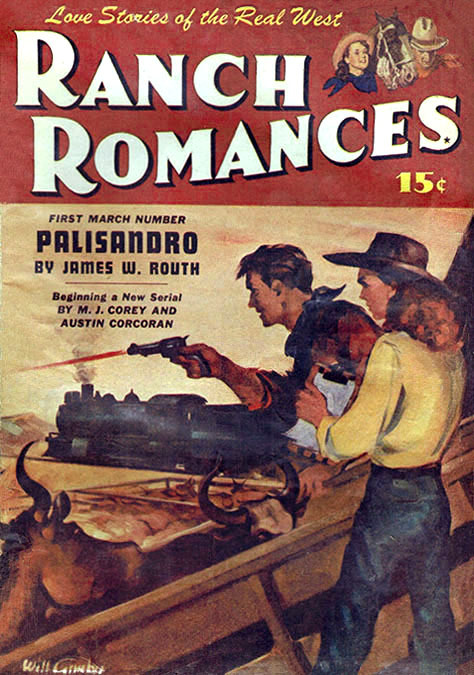 In June of 1932 William Gimbutis graduated from high school, where he had become interested in a career as a commercial artist. 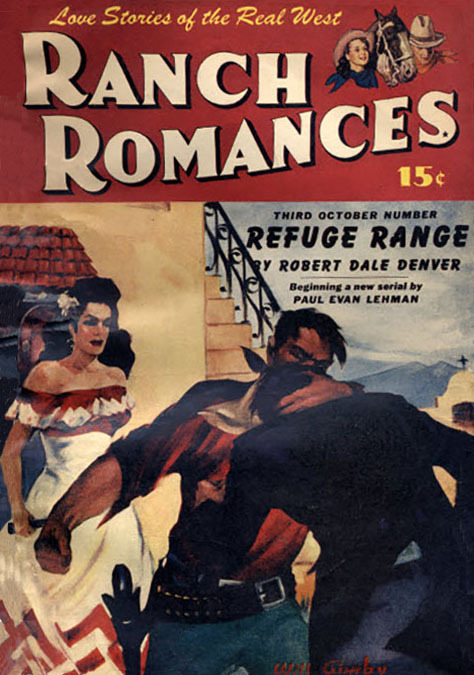 During the Great Depression the Gimbutis family could not afford art school, so he entered the work force as an assistant to a pressman at a printing shop, where senior staff artists gave him on-the-job training to produce lettering, designs, and artwork for local newspaper advertising. On February 18, 1934 the father, Adamos Gimbutis, died at the age of forty-nine in NYC. On October 7, 1934, seven months after this tragic death, the mother, Monica Gimbutis, married her second husband, Paul Witkus, in NYC. He was age fifty-four, and was also a tailor from Lithuania. The mother and step-father moved to their own apartment in Queens. In 1935 the two brothers lived together at 107-33 117th Street in the Richmond Hill section of Queens, NY. 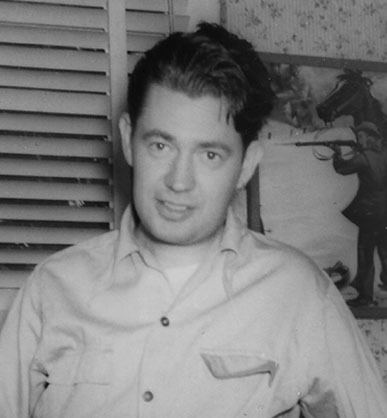 The older brother, Albert Gimbutis, began to work as a civilian electrician at the Brooklyn Navy Yards, where he used the assumed name "Gimby", as an Americanized version of the family name "Gimbutis." His younger brother followed his lead and also began to use the new name, "William Gimby." At that same time, William "Gimby" Gimbutis began to attend the Pratt Institute School of Art in Brooklyn, where his art teachers included H. Winfield Scott, John Fleming Gould, and Rudolph Belarski. In 1937 the older brother, Albert Gimbutis, proposed to his sweetheart, Valerie Wilkes, whose own original Lithuanian family name was Vilkas. She accepted his proposal, but insisted he legally change his name to "Gimby." On July 30, 1937, a legal notice was published in The Brooklyn Eagle to publicly announce the official name change of "Vitalt Gimbutis" to "Albert Gimby." No similar applications were ever filed to make "William Gimby" a legally registered name. On August 22, 1937 the older brother, Albert Gimby, married Valerie Wilkes at the Church of the Annunciation in Brooklyn, where "William Gimby" was his brother's best man. Albert and Valerie Gimby had four children, Robert Gimby (b.1940), Richard Gimby (b.1942), Paul Gimby (b.1944), and Cynthia Gimby (b.1953). After the marriage, William Gimbutis lived alone in his apartment at 107-33 117th Street in Queens, so his mother and step-father moved in with him. All three were listed together in the 1940 U.S. Census, which identified "William Gimbutis" as a "Pressman" at a "Printer's Shop." In 1942, at the age of twenty-eight, William Gimbutis began to suffer from swollen and painful wrists, hands, and joints. His condition was correctly diagnosed as early symptoms of the chronic disease, Rheumatoid Arthritis. These afflictions made his work at the printing shop increasingly difficult. In 1943 during WWII William Gimbutis was not selected for military service because of his chronic disability. This status allowed him to remain a civilian at a time when the NYC publishing industry was suffering a massive talent drain, as more eligible men were drafted. 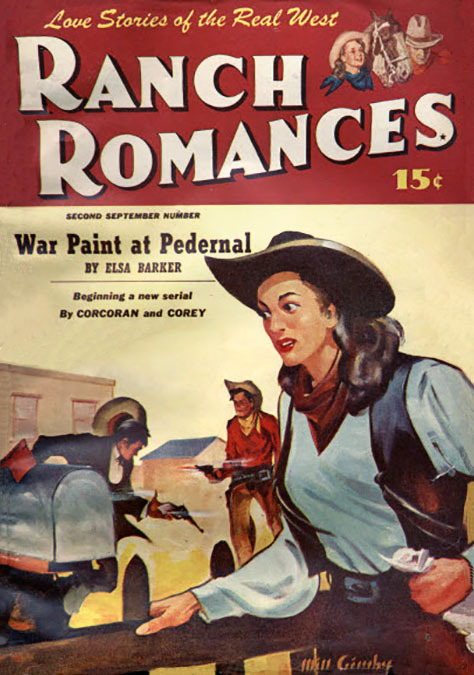 William Gimbutis assembled a portfolio and began to visit the offices of art editors at publishing houses to look for work as a commercial artist. 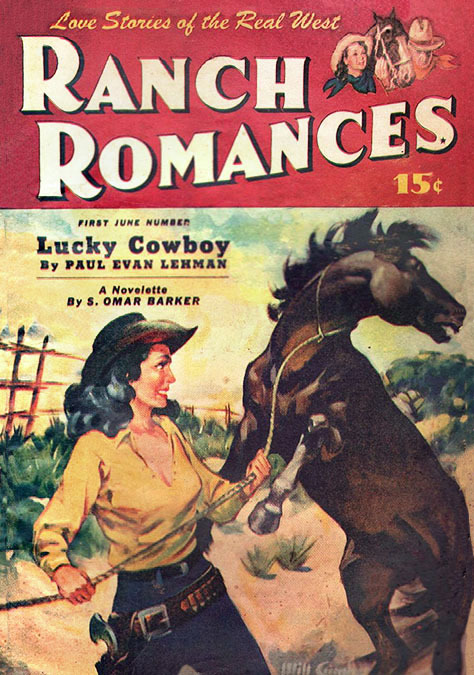 In 1945 he began to sell free-lance cover paintings to Warner Publications for their pulp magazine, Ranch Romances. 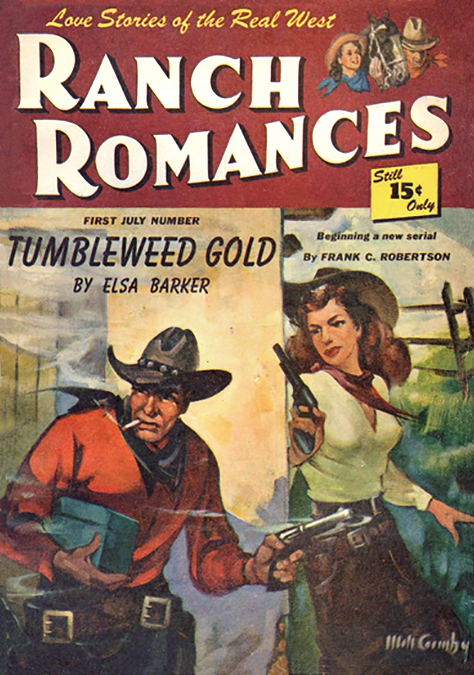 All of his published work was signed "Will Gimby." In 1946 William Gimbutis, with his mother and step-father, left Queens, NY, and moved to Hillcrest, NY, a small hamlet next to Spring Valley, in Rockland County, an upstate suburb of NYC. 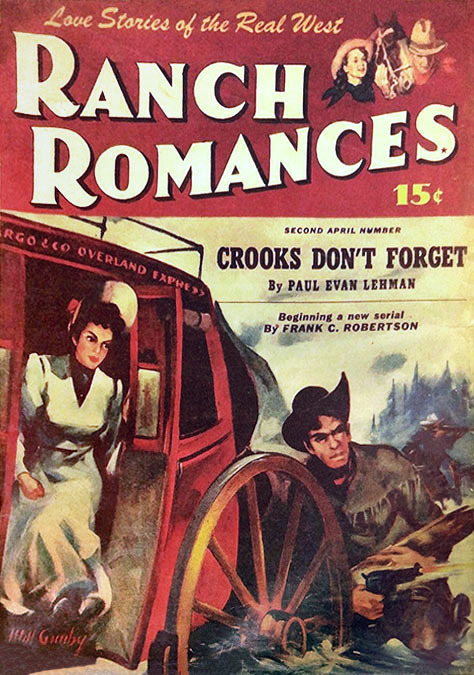 The artist became a regular contibutor to Ranch Romances. 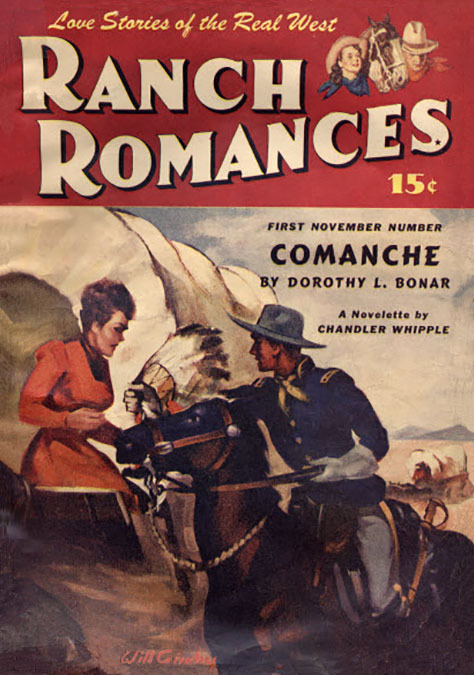 He would drive the family car down to the Mid-town Manhattan offices of Warner Publications, at 515 Madison Avenue and 53rd Street, to drop off completed cover paintings and to receive new assignments. In 1947 "William Gimby" was listed as a donor to the Rockland County Art Museum. 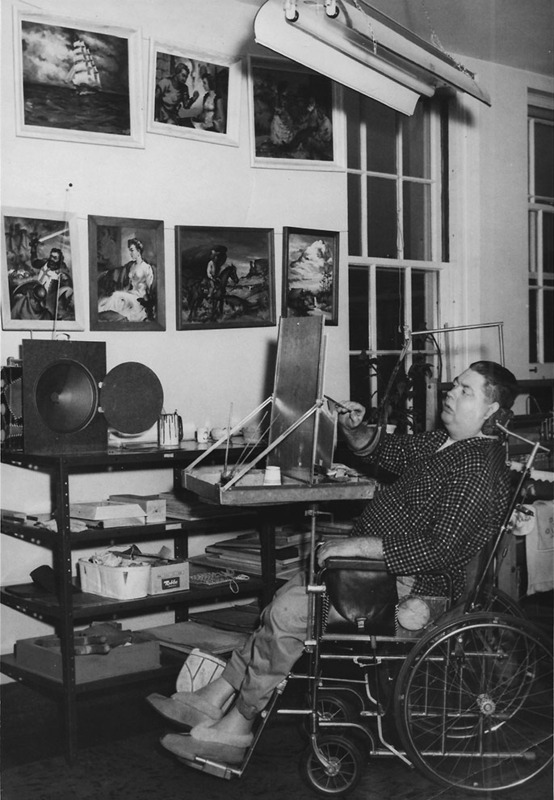 By 1948 the artist's chronic disability had made it too difficult for him to drive a car, and he was soon confined to a wheelchair. 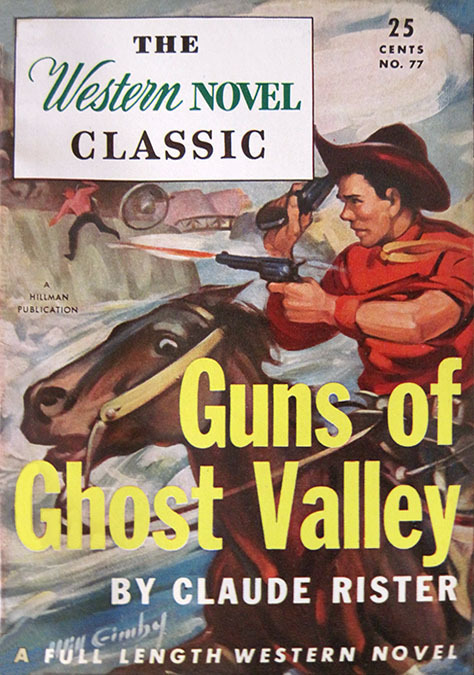 In 1950 William Gimby painted covers for Western themed digest-sized paperback books produced by Hillman Publications. In 1953 the older brother's family left NYC and also moved to Spring Valley, where they lived nearby at 36 Herrick Avenue. 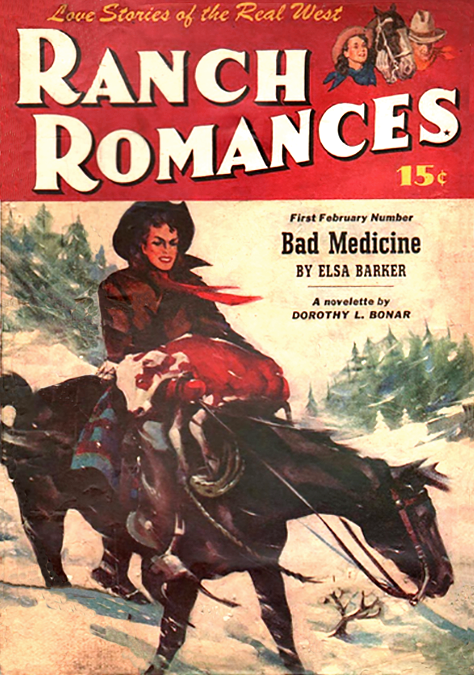 According to the artist's niece, Cynthia Gimby, "Uncle Will's rheumatoid arthritis grew worse over time. He loved to paint, and often needed to brace his arm to do so. When his condition got really bad, he was eventually bedridden, but still kept painting. 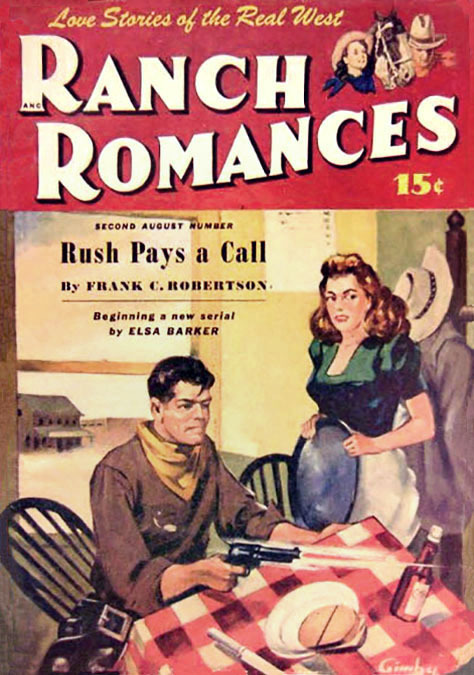 He finished lots of oil paintings of a variety of types, often featuring strong action scenes. 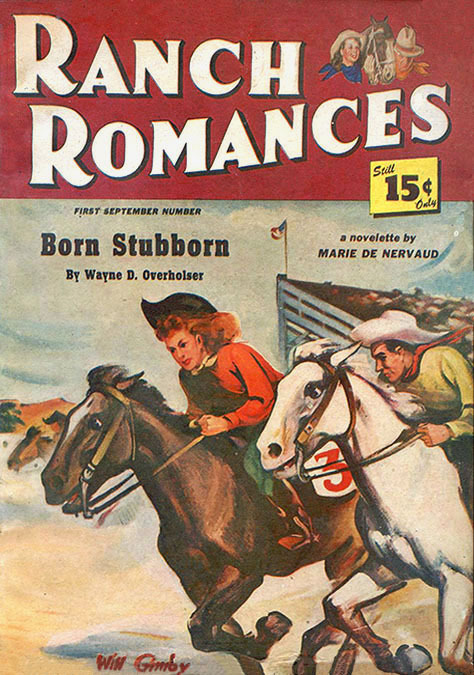 One I always remember was a wild-haired woman in a suit of armor. My grandmother hung it in their living room! However, an experimental treatment using gold was tried, and he did better for a time, but the gold treatments irreversibly damaged his kidneys and he died." 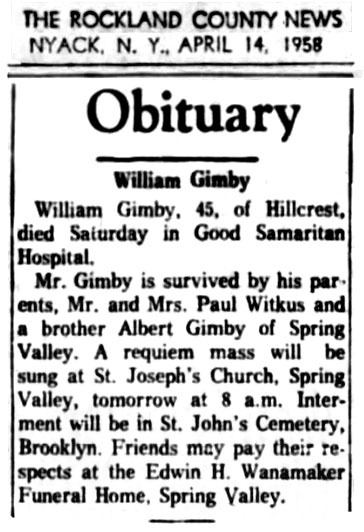 William Gimby passed away at the age of forty-five in Spring Valley, Ramapo Township, Rockland County, New York, on April 12, 1958.